This page describes how to assemble the Ardumower PCB, flash the Arduino and configure the robot mower. 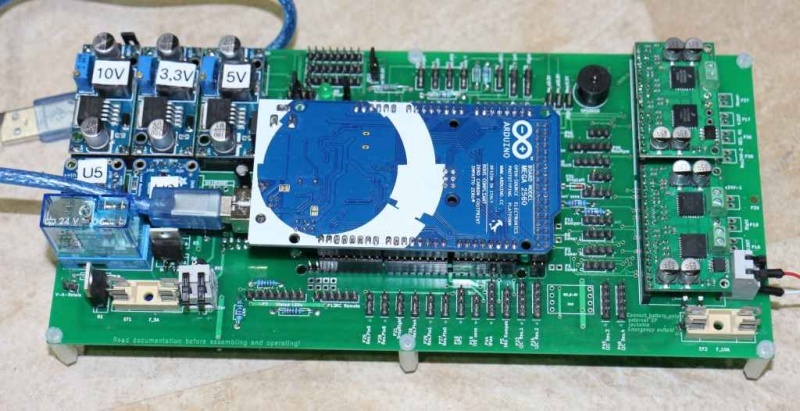 The controller is built around a ready microcontroller board (Arduino Mega 2560 using 54 I/O pins). All modules can be purchased as complete kits via the shop . NOTE: The schematics and PCB files were created with KiCad. They can be downloaded from github and can be edited by open source KiCAD software (Download here or here). Bluetooth programming mode JP2: CLOSE JP2: OPEN Use for reprogramming baud rate etc. Please also read the section 'Voltages' under Motor driver for more information on motor voltages. It is recommended to use a voltage step-down converter (e.g. module using LM2596) to generate the 5V voltage for the Arduino and all additional modules. Before connecting, set the voltage of the converter to 5V. Warning : never connect more than 5V on the Arduino 5V pins, or you will damage the Arduino. 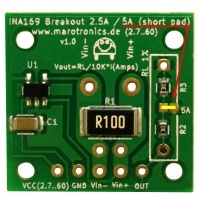 Therefore, always measure the 5V voltage before connecting it to the Arduino 5V pin! All components together (as shown in the schematics) need about 5W power. NOTE: If you have never worked with Arduino before, read our 'Arduino first steps' introduction. Finally, download and start the Arduino IDE to flash the code to your Arduino. Arduino Version: It is very Importent that you use the Arduino IDE version 1.6.3 or above AND select the right Board (Mega 2560 or Due). Important for Arduino IDE 1.6 or higher: if you see any folders inside the code folder (e.g. 'unused'), please delete them before compilation! Note: Always verify that the pin configuration in your Arduino code (config.h/mower.cpp) matches your actual circuit! The robot uses settings that you can adjust for your own robot and environment (via pfodApp or directly in the code). The default settings (factory settings) are stored in the config file 'mower.cpp'. In this file you can find a description of all settings. The settings can be adjusted via Android phone (pfodApp). Important: If you uploaded a new version into your robot, reset all settings via pfodApp once (Settings->Factory reset). This will delete all existing settings. Old settings can produce malfunction if the internal settings format has changed. 2. The software offers a serial console mode. Open the serial console in the Arduino IDE (CTRL+SHIFT+M) and set the baudrate to 19200. The motor and sensor values should appear constantly. First let's delete any existing error. Send the letter 'd' to the Arduino. 3. Run the ADC calibration, so that the ADC signals are symmetric around zero. Security note: For security reasons, always remove mower blades in your first tests! You should verify that the wheel motors are controlled correctly and in the right direction. Increase 'motorAccel' in 'mega.cpp' if the motors are not accelerating quickly enough. Using the key 'v', you can toggle between sensor trigger counters and current sensor values. Additionally, you can use pfodApp (Android) to plot the sensors (trigger counters and current values) over time. This allows you to wirelessly monitor your robot mower for error diagnostics. It is highly recommended. If there's a communication problem or another serious problem, the error counter increases. The error counter can be monitored via pfodApp. Additionally, the robot mower will beep when started. See section Troubleshooting for details on all errors. Several components (Arduino Nano, RTC, IMU, etc.) are communicating via the I2C bus (SDA/SCL wires). These wires should be very short (maybe even twisted) and they should be far away from DC converter and motor drivers. If there's a communication problem, the error counter will increase and robot will beep when started. The error counter can be monitored via pfodApp. This page was last modified on 1 April 2017, at 08:14. This page has been accessed 89,790 times.